Don’t let your vegetables sit in the veggie drawer and wilt to waste. Use them to make a broth. Plus, store bought broths have some unnecessary ingredients, so let’s cook our own! I started off by cooking all the vegetables and herbs in some vegan butter. Not too long, just enough to make them sweat, and slightly soft. This releases some of the flavors before adding the water. Then I add enough water to completely cover it all, plus a little more because some of the water will evaporate while cooking. Add the salt, seasonings, and ground herbs. Turn up the heat till it boils, then lower the heat to a slow simmer..put on the top and let it cook slowly for about an hour. Let it cool. Then remove the veggies. I throw them away😞but there’s no longer any flavor left in them, so there’s nothing else you can do with them, unless you compost. Here’s another tip: This recipe is perfect for those times when you have a lot of odd and end veggies in the fridge. You know, when you have a lil this, and a lil that. Instead of letting those small amounts go bad, go ahead and rinse them, let them dry, and place them in a freezer bag. 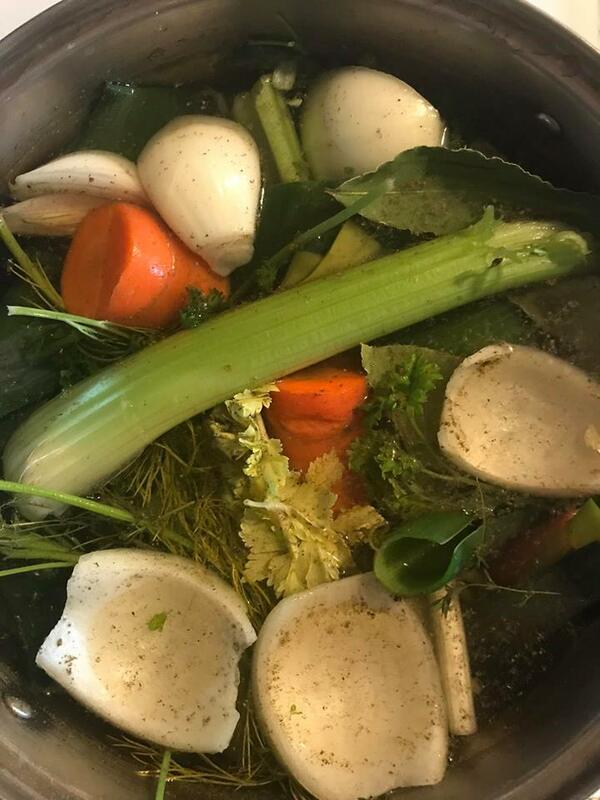 When the bag gets full, you’re ready to make your own broth!